As the United States recovers from the Great Recession, there’s one field that’s been relatively impervious to the economic downturn: careers in heating, ventilation, air conditioning, and refrigeration (HVACR). In fact, the Bureau of Labor Statistics (BLS 2017) projects that job openings for HVAC installers and mechanics will swell 15 percent between 2016 and 2026, much faster than the average growth anticipated across all occupations during that time (7 percent). The expected addition of 48,800 HVAC positions is due in part to people’s enduring need for comfortable shelter in the face of increasingly erratic weather patterns. By illustration, the World Economic Forum (2017) – which has tracked the uptick in natural disasters such as Hurricane Katrina and Superstorm Sandy – correctly predicted in its annual risks report that extreme weather events and natural disasters would represent two of the three most likely risks we would face, globally, in 2017. Hurricanes Harvey and Irma, as well as the “perfect storm” Napa, Sonoma and Lake County wildfires, and the off-season winter wildfires in Los Angeles, have all borne this out. And all of these events have contributed to the need for failproof climate control in residential and commercial buildings. With burgeoning trends such as the greening of HVAC technology, the adoption of “smart” climate control systems, and the ever-changing environmental regulations set forth by local and national governments, HVAC is expected to be thriving field on into the future. So what skills can these aspiring specialists expect to learn in HVAC classes? O*NET (2017)—a data organization partnered with the American Job Center—reports that heating and AC mechanics and installers have many responsibilities including installing, maintaining, inspecting, and repairing HVAC systems; performing tests to determine problematic components; working with sensitive systems such as water, electrical, and fuel lines; recommending upgrades to increase energy efficiency; and staying abreast of the latest technical innovations and governmental regulations for HVAC systems. 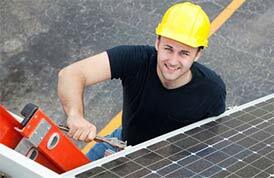 Some technicians choose to further specialize, gaining skills in specific aspects of HVAC such as solar panels, green technologies, commercial refrigeration, or radiant heating systems. Although there are varied educational paths to joining this field, O*NET (2017) found that 55 percent of responding HVAC technicians held postsecondary certificates, and 16 percent had associate’s degrees. Sixty-four percent of these professionals were industry contractors—a relatively secure segment as manufacturers and contractors may provide customers with year-round service agreements—and nine percent were self-employed (BLS 2017). Read on to discover the employment prospects for HVAC professionals, as well as to explore HVAC classes, professional certification options, program accreditation, and trends in the HVAC industry expected in 2018. 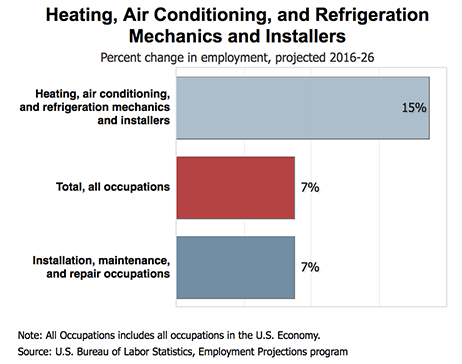 As stated above, the Bureau of Labor Statistics (BLS 2017) is anticipating a 15 percent increase in openings for HVAC technicians (i.e., mechanics and installers) between 2016 and 2026. The wealth of opportunities for HVAC professionals has emerged for several reasons. Not only do most HVAC units have a lifespan of roughly ten years—requiring continual upkeep and maintenance—but also many businesses and homeowners stand to save money by making systems more efficient or “greener.” Energy Star (2015)—a voluntary program promoting energy use efficiency created by the US Environmental Protection Agency (EPA)—reports that the combined annual energy costs of commercial and residential properties is $400 billion, and an astounding 30 percent of all energy used in commercial buildings is wasted. HVAC is also a relatively lucrative field, paying a mean annual wage of $49,530, with a median hourly wage of $22.64, significantly higher than the median hourly wage for all occupations, which is $18.12 (BLS 2017). Not surprisingly, HVAC professionals’ average salary fluctuates by region, industry, level of experience, and source of data. It’s crucial to note that the cost of living (i.e., the purchasing power of these salaries) varies significantly by region. 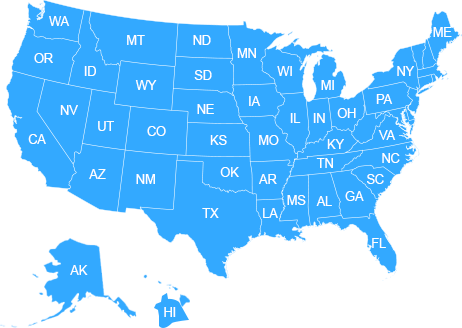 As proof of point, the Missouri Economic Research and Information Center (MERIC 2017) notes that the most expensive states in the country were concentrated in the west and northeast: Hawaii, District of Columbia, California, New York, and Alaska. The least expensive areas—mainly hailing from the midwest and south—were Mississippi, Arkansas, Michigan, Alabama, and Oklahoma. For more information on employment trends in the HVAC industry, check out the HVAC careers page. There are varied educational paths to becoming a certified HVAC technician. Some choose to garner experience on the job through apprenticeships, and others enroll in accredited HVAC classes or programs. In a survey of HVAC technicians, O*NET (2017) reported that that 55 percent of the respondents in this field held postsecondary certificates, and 16 percent had earned associate’s degrees. As regulations on the HVAC industry and contractors continue to evolve, there has been a trend toward more formal education, although there are still ample opportunities for those interested in apprenticeships. Graduate from high school. Candidates in this profession typically have strong skills in the physical sciences (e.g., chemistry, physics) and at this stage, may even seek out opportunities to assist working HVAC professionals, paid or on a volunteer basis. Complete an accredited HVAC program (6 months to 2 years). Community colleges, technical schools, and other institutions provide training programs at all levels (e.g., certificate, associate’s, bachelor’s) featuring coursework in HVAC system design; energy management; ductwork & piping systems; and load calculations. As part of these programs, prospective HVAC professionals not only receive didactic instruction to learn the theory of HVAC components and procedures, but also may work under the supervision of more experienced technicians to get hands-on training. There are various institutions that provide accreditation for HVAC classes—including HVAC Excellence and Partnership for Air-Conditioning, Heating, Refrigeration Accreditation (PAHRA). The accreditation process establishes educational standards and recognizes programs which meet or exceed the criteria. To learn more about accredited programs, visit the HVAC schools page. (Optional) Complete an apprenticeship (3 to 5 years). In lieu of a formal training program, some HVAC technicians choose to learn through an apprenticeship where they receive 2,000 hours annually of hands-on training in the field. Some of the organizations that provide HVAC apprenticeships include the Air Conditioning Contractors of America, Inc. and the US Department of Labor’s ApprenticeshipUSA program. Garner experience in the field (1 to 2 years). Depending on the type of certification an individual seeks, it may be advisable to get some empirical experience prior to applying for certification. Please note that there are some “job-ready” HVAC programs which may allow graduates to bypass this step. Achieve professional certification (timeline varies). Requirements to work as an HVAC specialist vary by state, but there are some popular certifications in this industry such as those offered by the North American Technician Excellence (NATE) and HVAC Excellence. To learn about state licensure requirements in HVAC and to discover more about about the steps to becoming a certified HVAC professional, check the how to become an HVAC technician and HVAC certification pages. For those interested in learning the fundamentals of the HVAC field, there are educational programs available throughout the country in addition to distance-based options at every level: certificate, associate’s, and bachelor’s programs. 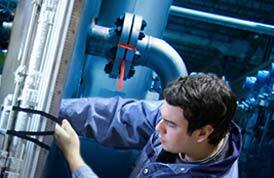 Following is what students can expect from various HVAC certificate and degree programs. The University of California, Berkeley Extension offers an HVAC certificate program with both classroom-based and online learning opportunities. Students will complete 165 hours of coursework in areas such as system design considerations, system load calculations & psychrometry (i.e., properties of gas-vapor mixtures), and ductwork & piping systems. In addition to their certification, graduates receive a certificate of accomplishment from the Golden Gate chapter of the American Society for Heating, Refrigeration and Air-Conditioning Engineers (ASHRAE). The University of Northwestern Ohio (UNOH) in Lima provides a PAHRA-accredited HVACR certificate program, training students in the fundamentals of furnace technology, commercial refrigeration, and air conditioners. In a combination of rigorous hands-on instruction with qualified HVAC professionals and Simutech computer exercises, UNOH teaches students the latest in service & procedures, heating systems & controls, applications of refrigeration & temperature controls, and other cornerstones of the field. Finally, UNOH boasts small class sizes with a maximum of 20 students and also offers an HVACR associate’s degree program. Front Range Community College in Loveland, Colorado provides a PAHRA-accredited associate of applied science (AAS) degree in HVACR. With 65 credits of classes in areas such as refrigerant tubing, basic electricity & electrical components, and HVACR troubleshooting, Front Range’s program takes four to five semesters to complete. In addition to didactic coursework, students have the option to complete a capstone project or supervised internship to put their newfound knowledge of fabrication, brazing, soldering, and more to the test. Mount San Antonio College (MTSAC) in Walnut, California provides an associate of science (AS) degree in air conditioning and refrigeration technology. As the only PAHRA-accredited program in the state of California, MTSAC has a work-study component for interested students in addition to training in refrigerant handling, welding, and mechanical & electrical operation. This program is also offered as a certificate. The New York City College of Technology in Brooklyn provides a bachelor’s of technology (BTech) degree program in facilities management. This program is an extension of the school’s associate of applied science (AAS) degree in environmental control technology (HVAC) and gives students a working understanding of how to maintain comfortable indoor climates while paying thought to energy conservation and efficiency. This bachelor’s degree may be an especially attractive option to aspiring HVAC professionals who are interested in taking on management roles and increased responsibilities. Lewis-Clark State College in Lewiston, Idaho offers a bachelor of applied sciences (BAS) in HVACR. The program requires 120 credit hours, including general education courses and all introductory HVAC courses as required by the associate of applied science curriculum, Lewis-Clark graduate with the hands-on experience required to enter the workforce. For more information on four-year HVAC and HVACR programs, please visit the top HVAC bachelor’s degrees page. The Ashworth College based in Norcross, Georgia provides an online HVAC training program that can be completed in as little as four months. The Ashworth program includes a voucher towards the student’s cost of certification from ESCO. Penn Foster Career School based in Scranton, Pennsylvania is a college accredited by the Distance Education Accrediting Commission (DEAC) and offers an online HVAC career diploma. As part of the program, students receive a voucher to sit for the EPA certification—a mandatory credential for workers who handle refrigerants—as well as eight units of courses such as math for the trades, the fundamentals of HVACR, and lithium bromide absorption systems. Aspiring HVAC professionals are strongly encouraged to verify the accreditation status of their program prior to enrollment. The process of accreditation sets up industry-validated standards for training in HVAC to ensure that a school is meeting or exceeding the skill set necessary to uphold government regulations surrounding climate control and provide quality service to customers. Criteria for accrediting organizations may include specific curricular requirements; school finance assessments; and an examination student outcomes & support services. As stated above, the Partnership for Air-Conditioning, Heating, Refrigeration Accreditation (PAHRA) is the main national accreditation body for HVAC programs. PAHRA developed its program standards in conjunction with all segments of the industry including workers, HVAC educators, administrators, and state supervisors in technical education. PAHRA-accredited programs must use the industry competency exams (ICE) for graduating students, which test knowledge in three areas: residential AC and heating, light commercial AC & heating; and commercial refrigeration. These exams are administered by North American Technician Excellence (NATE). Additionally, HVAC Excellence has accredited HVAC programs since 1999. A two-person team (an HVAC instructor and an administrator) performs on-site evaluations and weighs criteria such as the mission of the program; school finances; the availability of student services; the quality of student facilities; and instructor credentials. There are a number of regional and national professional certifications available to HVAC professionals. The certification process indicates to prospective employers and clients that the person has achieved competence in specific fields of HVAC. There is one mandatory certification for all HVAC professionals who handle refrigerants: the EPA Section 608 certification. Preparation for this exam and vouchers are typically offered as part of an HVAC program. There are four types of certifications available for EPA Section 608: type I (small appliances), type II (high-pressure appliances), type III (low-pressure appliances), and the universal option that covers all aspects of handling refrigerants. It is important to note that while the EPA certification is mandatory, licensure and certification requirements vary by state. Visit the HVAC certification page for a full list of state agencies to verify the credentials necessary to work in this field. HVAC Excellence provides the heating, electrical, air conditioning technology (HEAT) and HEAT Plus certifications for high school students. They also have a variety of employment-ready specialty credentials in green awareness, residential heat load analysis, the use of R-410A refrigerant systems, heat pump service, combustion analysis, residential air conditioning, and HVAC educator certifications. North American Technician Excellence (NATE) has a core HVAC exam and specialty certifications in air conditioning, air distribution, oil heating (air), gas heating (air), heat pump (air-to-air), hydronics gas, hydronics oil, commercial refrigeration, and light commercial refrigeration. NATE also provides industry competency exams (ICE), which are required of all students graduating from a PAHRA-accredited program. Please note that many of the specialty exams are also available in Spanish. The Refrigeration Service Engineers Society (RSES) offers the mandatory EPA Section 608 and eight specialized exams: commercial air conditioning, commercial refrigeration, controls, domestic service, dynamic compression, heating, heat pump, and HVACR electrical. For more information on professional certification and licensure, please visit the HVAC certification page. Smart Systems: One of the major trends in the industry is toward “smart controls” in both residential and commercial HVAC systems. The US Energy Information Administration (2017) reported that although they can improve on energy efficiency, just 3 percent of respondents to their annual survey were using a smart thermostat — but that number is expected to increase. These intelligent controls also allow people to track energy-use patterns, detect problems with components, and send diagnostics via mobile technologies to the appropriate service agency to ensure timely maintenance and repairs. The burgeoning internet of things (IoT) has been a major driver in the automation and increased distance-based control of HVAC systems. Increased Integration and Automation: Aided in part by the increased use of “smart” HVAC technologies, the ability to control several systems seamlessly in concert is a major goal in the industry. It is no surprise that homeowners, property managers, and business operators can benefit from having one easy-to-operate interface for temperature controls. In fact, HVAC businesses are striving to improve the mobility, user-friendliness, and comprehensiveness of software that can link multiple systems together. HVAC Goes Green: Green technology systems that pay thought to energy conservation and efficiency are on the rise. Enervise (2015) stated that the federal government’s property-assessed clean energy financing (PACE) program has contributed to the awareness of efficiency, renewable energy sources, and the greening of HVAC by empowering local governments to fund much-needed energy improvements to residential and commercial properties. Governments pay up-front for the upgrades and property owners pay these back over time. Furthermore, buildings are striving to be net zero energy use facilities (i.e., producing as much or more energy than they consume) through the use of renewables (e.g., wind, solar, geothermal, and hydraulic) and energy recovery ventilators. Evolving Regulations: Federal and local governments are continually changing the standards of energy use, product labeling, building codes, and tax credits, in effect rewarding the use of more efficient HVAC technologies. The US government’s Office of Energy Efficiency and Renewable Energy (EERE) strives to develop innovative technologies to promote energy efficiency in manufacturing plants, HVAC products, new homes, and buildings. Legislation such as the Energy Policy Act (2005), as well as changes to the annual fuel utilization efficiency (AFUE) standards and seasonal energy efficiency ratio (SEER) are applied differentially across states, affecting building codes and the type of HVAC equipment available. Proprietary Controls: Although there’s a general move toward increased integration of HVAC systems, in order to preserve market dominance, some companies continue to create proprietary components which do not integrate seamlessly with other company’s products. HPAC Engineering (2015)—using figures from an IHS, Inc. (2014) study—reported that 14.2 of worldwide controllers used proprietary controls. Students and graduates of HVAC training programs can turn to the HVACClasses.org blog to explore information on apprenticeships, certifications, HVAC colleges, HVAC professors, and more. Information posted on our blog will be updated on a regular basis so that ideas for careers, education, and continuing HVAC classes are right at your fingertips. Our aim is to make the information on our blog practical, informative and user-friendly and of significant help to students considering an HVAC education. To top it off, we link to many of the resources mentioned within our blog posts so that readers don’t have to spend their time doing that research. 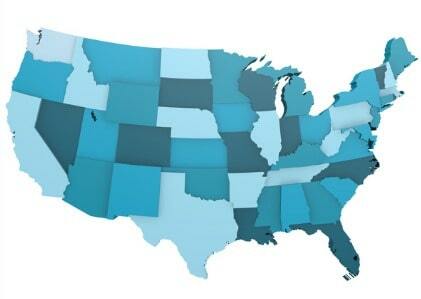 Several states are outpacing the national average for growth in the HVAC sector, and with good reason. Efficient and stable climate control is no longer a luxury, and in some cases, it can be a matter of life and death. Five Innovative HVAC/R Training Programs in the U.S.
Today, mastering the skills of HVAC/R can be an especially useful trade, as all residential and commercial properties have environmental control needs. 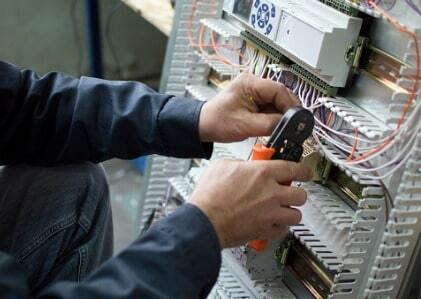 The most current systems are needed for installation into new homes and buildings, and older systems always are in need of repair or replacement.